Submitted by galenhawthorne on Sat, 12/09/2006 - 11:35am. 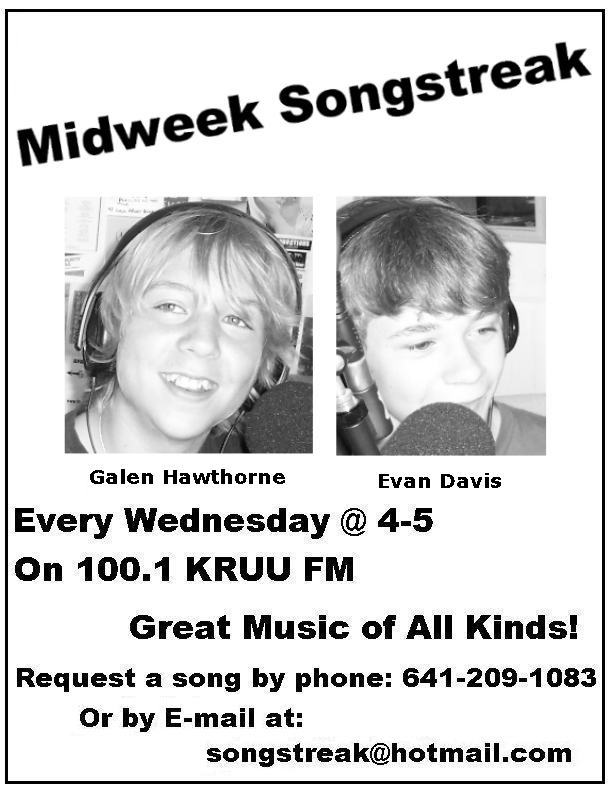 Hey, it's Galen Hawthorne, with the midweek songstreak! You guys should listen to my radio show at 4:00-5:00 pm on wednesdays. (I'm pretty sure you already know the station :P) I play everything. Any kind of music. I'm even taking requests. Tune in, Call in, if you know me, Come in, and just hang out with me. There's something for everyone on my show! Hey! This is Evan Davis, the co-host. Just wanted to remind everybody that they can make a song request, a shoutout, or something you want to hear us talk about by e-mailing songstreak@hotmail.com, and we'll try and do it as soon as we can. Thanks! Hey, this is Evan. I just wanted to let everybody know that we have a podcast-like online segment entitled "The Midweek Podstreak." We'll try and do it every week. To hear it, click on one of the links at the bottom of the page. You can listen right off the site, or download it to your computer or mp3 player. Thanks. Submitted by Miranda Jane (not verified) on Wed, 09/23/2009 - 4:30pm.